A well lit fireplace, snacks on the table, candles and …. a wet dog? Of course, that does not fit into the picture. With the EQDOG Doggy Dry bathrobe, that wet dog quickly becomes a thing of the past. In just 10 seconds the special bathrobe ‘pulls’ moisture from the coat of the dog. What does a wet dog prefer to do? To shake it’s self off naturally! Great for the dog, but not for your car, home or furniture. With the Doggy Dry bathrobe from EQDOG, dogs no longer have the chance to foul cars, corridors, walls, benches and stairs with their wet fur. 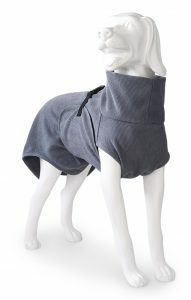 The Doggy Dry bathrobe is put on the dog immediately after it’s walk and the coat is dry in no time. The Doggy Dry bathrobe from EQDOG is made of fast absorbing microfibre material that absorb moisture from the dogskin. So: put the bathrobe on your dog and the microfibers will do the rest. What sets the bathrobe apart from other products? The Doggy Dry has, apart from the fast absorbing microfibers, an extra thick and wide collar and a wider belly flap to absorb all the moisture that runs along the body. Two adjustable buckles ensure excellent wearing comfort and the right fit for the dog. Moreover, it’s very easy to put on (and of) the dog. The fast-drying dog coat is therefore perfect for many a dog after a wet walk. Afterwards the DoggyDry can be thrown into the washing machine – although fabric softener is not a good idea. * Girth: the widest part of the chest, measured just behind the shoulders. ** Back length: the distance from the beginning of the neck to the tail. Want to see a demonstration? Or order quickly? Just call us at +31 (0) 6 109 104 63 or send a mail to info@noho.nl. NOHO agency is opgericht door Tim Doedijns, fervent skiër en hockeyer, wandelaar en trotse baas van Border Terrier Luca.